In Part 1, we covered Ancient Civilizations and Old Sites and Religious Places and Artifacts. In Part 2, we covered Royal Hangouts and Military-Related Places and Things. In Part 3, we covered Museums and Art Galleries, Libraries, and Aquariums. When I think of an impressive garden, I immediately think of Het Loo Palace, in The Netherlands. During Napoleon's occupation, the gardens were buried under rubble and used as a horse parade ground. Fortunately, when restoration work was started, the original plans were discovered and the beds and their ingenious irrigation system were rebuilt. For many people with green thumbs, Britain's Kew Gardens (or, more formally, the Royal Botanic Gardens, Kew) is the Holy Grail. 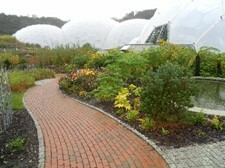 In 2012, while visiting the southwest English counties Cornwall and Devon for the first time, one of my main stopovers was the Eden Project (see left), a huge reclaimed clay pit with extensive outdoor gardens and two enormous controlled-climate, geodesic dome structures. Amusingly, the brochure claims they have "the largest rainforest in captivity". With 140 acres, the Desert Botanical Garden in Phoenix, Arizona is worth a visit. I happened to do it late on a Sunday morning where brunch was served to the sounds of a string quartet. That certainly aided the digestion. While not built as a garden, per se, nonetheless, Tucson, Arizona's Biosphere 2 is impressive. This self-contained living system was an experiment in building colonies on the moon or on some other planet. I've seen many cultivated gardens, but when it comes right down to it, it's hard to beat nature. For that, I'll take the rain forest in Central or South America, or a big patch of desert with saguaro cactus such as that around the Wild-West movie studio Old Tucson in Arizona. In the US, we have Disneyland (in Los Angeles, California), and Disneyworld and EPCOT Center (in Orlando, Florida). These definitely are for kids of all ages. Universal Studios has a number of parks as does the Busch beer group with its Busch Gardens. Just north of San Diego, California, in Escondido, there is a fantastic wild-animal park in a several thousand-acre setting that approximates each animal's native environment. On the backside of the main island of Oahu, Hawaii, is the Polynesian Cultural Center. Copenhagen, Denmark, boasts its Tivoli Gardens, and on the Jutland Peninsular, there is the original LEGOLAND, with its very own airport just across the road, really! The 1:25 scale model of Dutch life at Madurodam is near The Hague, and is definitely worth a visit, even if you don't have kids with you. In 2000, my son and I sat in on interesting debates at the House of Commons and the House of Lords in London. More recently, I toured Canada's Houses of Parliament in Ottawa. I've also toured the Senate and House chambers of the US Capitol, and listened to a debate in the House of Representatives. During one visit back to my own state capital, Adelaide, South Australia, I dropped in to the lower house to hear a debate in which everyone was in agreement, and it wasn't about pay raises for members either! To me, one of the most impressive parliamentary buildings is Germany's Reichstag in Berlin. 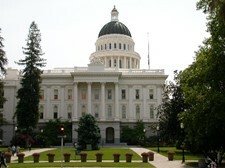 Although its dome was destroyed, the building has been beautifully restored to its former glory with a clear-glass dome. The tour to the rooftop is worth the effort. And the large vertical sculpture-like sail inside the dome is actually an enormous set of mirrors that tracks the sun and channels its light down into the main chamber. While hiking the Thames Path, I rested for a few days in/near Oxford where I visited the Duke of Marlborough's home, Blenheim Palace. Winston Churchill was born there, and he and his darling Clementine are buried with numerous relatives at the Bladen cemetery nearby. Oxford is indescribably beautiful; just go visit it! Twice I've visited Runnymede, to see where the Barons forced King John to sing the Magna Carta. While touring Scotland, by sheer accident, my family and I got off the train to find that we were in a village near the famed Loch Lomond. 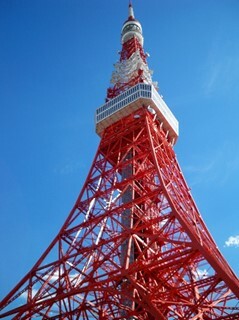 So we spent several great days there. Odense, Denmark, on the large island of Fyn, is home to Hans Christian Andersen's House. On a 3-day layover in Iceland, I got to see an enormous geyser erupt, right next to me. It sure is a pristine country. While crossing the Patagonia in Chile and Argentina I got to see several glaciers up close, as well as a large iceberg that had broken off and run aground way downstream in the desert. If you'd like to tour a very comfortable 100-room castle, Toronto, Canada's, Casa Loma, is a good place to start. In a word, the national, state, and local parks systems in the US are fantastic! To name a few, I've been to Yellowstone, Yosemite, The Badlands, The Black Hills, Luray Caverns, Wind Cave, Western Grand Canyon, and Mt. Rushmore. The bison herds in Custer State Park, South Dakota, and on Ted Turner's ranch in Montana are worth a look. Niagara Falls is pretty impressive as well. A visit to Hearst Castle in Southern California will show you how to build a nice "little" country place, which, at one time, had the world's largest private zoo. Not to be outdone, the Vanderbilts constructed their country estate, Biltmore, in North Carolina. Much smaller, but nonetheless impressive, homes include Mount Vernon (George Washington) and Monticello (Thomas Jefferson). To see the OK Corral where that famous wild-west gunfight took place, and Boot Hill cemetery, go to Tombstone, Arizona. The oldest European settlement in North America can be seen at St. Augustine in Florida. And last, but by no means least, Texas has The Alamo, near San Antonio; Judge Roy Bean's famous bar and sometime courthouse in Langtree; and the Texas School Book Depository, from where Lee Harvey Oswald supposedly assassinated President Kennedy. Yes, the Amazon River is impressive, and yes, it has piranhas, Cayman alligators, and leaky dugout canoes. (I know, because I was the one bailing out the water!) Some butterflies I saw were the size of a dinner plate! I also encountered a friendly, and quite large, tapir. If you are in the mood to visit a prison as a tourist, Alcatraz and Folsom are worth the effort. While the former is no longer in operation, the latter is, and you can take photos or video, so long as you don't include any guards or prisoners in your shots. Really! And, yes, Johnny Cash did perform there. Olympic Stadia/Villages are worth a visit. 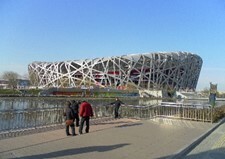 I've seen those in Montreal, Canada; Helsinki, Finland; and Beijing, China's, famous "Birds Nest" (see left). The Beijing Water Cube swimming center certainly is impressive. There is an old saying that goes something like, "Those who can, do, while those who can't, teach!" While I have great respect for most schoolteachers, I certainly would apply a modified version of this adage to art (and book and music) critics. Frankly, I never have been interested in hearing what the critic thought the artist "must have been thinking", when they executed some particular work, or whether they were "on or off their medications". I started Part 1 with a mildly disrespectful attitude toward Kulcha from an Aussie's perspective. Such attitudes were hardly discouraged when in 1973 the Australian Government paid a princely sum for Jackson Pollock's painting Blue Poles. "Trust us; it's a national investment", they said of the abstract painting, despite that the average person in the street thought their kindergartner had done something better. Soon after its purchase, paint started to peel and it needed substantial restoration work. C'est la vie! So, what's still on my bucket list? The Pyramids and Sphinx in Egypt; Canberra, the capital city of my native country, Australia; actually going inside the White House; Vancouver Island, Canada; the island of Bornholm in Denmark; hiking hut-to-hut in the Swiss Alps; certain parts of Greece and Turkey; Andalusia, Spain; Morocco; New Zealand; Slovenia; Yorkshire, England; going the full length of the Danube River on a working barge; and some driving trips in the US to visit various Presidential Libraries. So, after visiting all these places and seeing all these things, am I more sophisticated? Probably, but I still get confused when there is more than one knife and fork at my table setting! I hope this series has helped improve your Kulcha Quotient. Finally, I have been to the Desert Botanical Garden in Phoenix. I was there for a conference and talked another attendee from Michigan to go with me. I never knew there was so many kinds of cactus.